What gives the human brain the creative ability that defines us all as individuals? Although the silicon version is hard on its heels, the brain remains the most remarkable computer in existence. 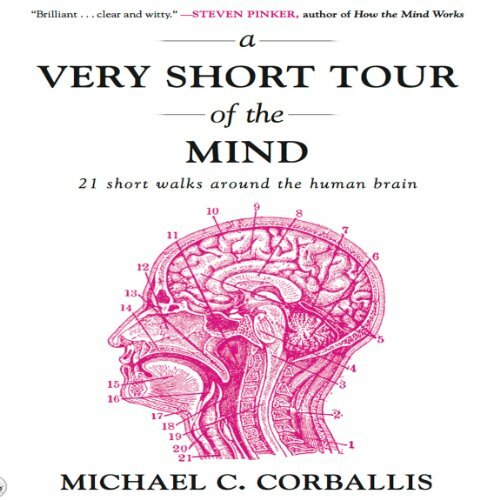 Leading us through cognitive theory, neuroscience and Darwinian evolution with his trademark wit and wisdom, Michael Corballis explains what we know - and don't know - about our minds. How do we know if we're really the top dogs in brain power? Does our creativity stem solely from the right brain? From language to standing upright, composing music to bull, he uncovers our most common misconceptions and the fascinating habits and abilities that make us human. This is exactly what the title says it is. A very short tour of the mind. It's essentially a collection of author Michael Corballis's magazine articles on subtopics related to mind and behavior. The articles are fun, interesting and short. But be warned, they are 100% not suitable for individuals with a low tolerance for nerdy as hell puns. I think my favorite part about Corballis's work in general is his evolutionary orientation. It's spot on. I for the life of me can't understand the resistance to evolutionary psychology. There's obviously really bad examples of evolutionary psychology (just like every other branch of science), but to reject the very idea of an evolutionary analysis of human cognition and behavior on principal (like many of its critics do) seems ultimately indefensible. As far as I can figure, brains evolved just like everything else biological. Anyway don't get me started. If you're a psych nerd you won't find anything here that you didn't already know, but what ever. I didn't learn much but I found value in the interesting presentation of the ideas and I more or less related to the articles as breezy little refresher snacks. This is a fun little book, but if you're in the mood for deep, keep looking. Try some of Corballis's long form stuff like The Recursive Mind if that's what you're wanting. Great book. I highly recommend. especially for anyone who works in the education or therapy fields. Given the image on the "cover" and the title, I thought this was a book about the brain. It is not. Easy to digest and interesting book that covers some interesting facts about human psychology.